This Spring, Turkish-Dutch artist Fahrettin Örenli's presents a solo exhibition, Money without Nationality, opening at Pi Artworks London. Fahrettin Örenli [1969, Turkey] lives and works between Amsterdam, Istanbul and Seoul. 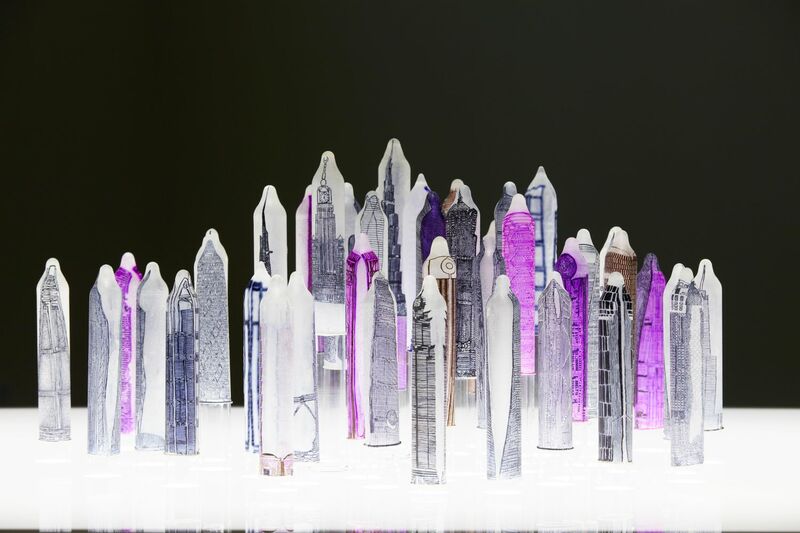 The exhibition ‘Money without Nationality’, is a series of works across drawing, painting, sculpture, photographs and poetry, examine the psychological and physical aspects of cities as living organic structures, perceiving them as control towers for the distribution of mass information. A version of the presentation in London at Pi Artworks was shown in Seoul, at Art Sonje Center in late 2017, but this is the first time these artworks will have been seen in Europe. ‘Money without Nationality’ investigates how humanity has blinkered itself in the process and got lost inside man-made nature, hypnotized by the power of synthetic sunsets placed by their own hands on the horizon, for instance, or by choosing not to recognize certain truths in the name of economic interests. High Heels, a central series in the exhibition, borrows its title and theme from the story of Turkish writer Ömer Seyfettin to ponder the problematic issues contemporary societies in different corners of the world face today. The core message of the story is: "We are aware of our problems, but not wanting to face them, we avoid them." At times these problems are painful, even unbearable to acknowledge, so we stand and stare helplessly, accepting the consequences as though they were the workings of fate. This critical message threads through the project, which explores the invisible workings and hidden powers that allow for financial investments to move under the surface of contemporary life, unbound by and irrespective of borders. Money without Nationality also connects Örenli’s past and current artistic practices through its focus on knowledge in the present and future, and sustainability/disappearance of accumulated knowledge even posterior to the end of our physical existence in the universe. His aim is to explore the impact of socioeconomic and political issues on creating sustainable knowledge for the future, and the ways by which cities are psychologically and physically shaped into complex entities that then assimilate information. Fahrettin Örenli (b.1969, Turkey) lives and works between Amsterdam, Istanbul and Seoul. He studied at Gerrit Rietveld Academie and Rijksakademie Van Beeldende Kunsten, Netherlands. He participated in artist-in-residence programs at the MMCA residency Changdong (2017); Platform Garanti Contemporary Art Center, Istanbul (2006–07) and ISCP, NY (2003). Örenli was awarded the ABN AMRO Art Prize, Amsterdam (2004) and the Royal Painting Prize, Amsterdam (2000). His works were shown in several international institutions and exhibitions like the Museum of Antioquia, Medellín (2017); DEPO, Istanbul (2016); Stedelijk Museum Bureau, Amsterdam (2015); Istanbul Modern, Istanbul (2014). His next solo exhibition will be shown at Pi ArtWorks (London) and Project Fulfill Art Space (Taipei) in 2018. Pi Artworks London/Istanbul was founded in Istanbul in 1998. In 2013, it expanded internationally and opened a space on Eastcastle Street, Fitzrovia, London. Pi Artworks continues to be one of Turkey’s primary galleries and has now established a strong commercial market in London, as well as a range of institutional links in the past 5 years. Since opening the second, London venue, Pi Artworks has worked to enrich the UK art scene with their knowledge and has developed relationships with institutions, individuals and partners both within the capital and across the country. The gallery has helped realise major institutional exhibitions in the UK such as Susan Hefuna at The Whitworth, Manchester (2017) and Ipek Duben at Fabrica, Brighton (2017). Meanwhile, it continues to forge a global path with exhibitions realised including Tayeba Begum Lipi at the Broad Museum (2016), Fatma Bucak’s upcoming show in Fondazione Merz (2018) and in collaboration with the Sonje Center on Fahrettin Orenli’s solo presentation Money without Nationality (2018). Pi Artworks has initiated collaborations with universities and academics in London and beyond in the past 5 years, including a long-running Curatorial Open, arranged with the University of Goldsmiths (UAL) and which includes exhibition making, performances and curatorial guidance for aspiring art world employees studying in the capital. Pi Artworks has also commissioned a rich and varied range of new exhibitions in London - including a series initiated by curators such as Sacha Craddock, Oliver Sumner and Morgan Quaintance. Meanwhile, in Istanbul, Pi Artworks continues to forge key relationships across the region and globally, working with institutions, arts festivals and biennials. A recent success has been the 2017 Istanbul Biennial, where the gallery’s artist Volkan Aslan’s presentation was lauded by visitors, the media and collectors. Pi Artworks is also one of three stakeholders who have recently created a brand-new exhibition space for Istanbul, encouraging a high footfall in a slowing market, with a fresh space for contemporary art in the city and region. Founder and Director Jade Y. Turanli is based in London and currently sits on the Contemporary Istanbul selection committee and has been on the Tate Middle-East Acquisitions Committee since 2013. Turanli is also a member of AWITA, association of Women in the Arts.